One of the unique characteristics of the cooperative system is that we are governed by a Board of Directors who are active agricultural producers. 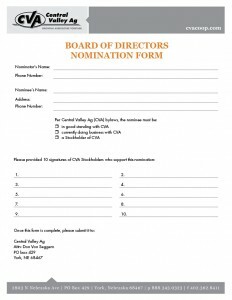 If you or someone you know would like to run for election to the board of directors we encourage you to submit a nomination form for consideration to the nominating committee. The nominating committee will then determine the slate of candidates. CVA stockholders are eligible to vote in all director elections. The election will be carried out by mail. Ballots will provide you with a list of nominees, their biographies and a return envelope. Election results will be announced at the Annual Stockholder Meeting on November 19, 2018.